Got a Secret? Whisper It To The World–With Whisper | OhGizmo! By Hazel Chua on 01/22/14 • Leave a comment! Do you have some things you want to get off your back? Some confessions you want to reveal, or some secrets that you want to share? Everybody does. But most people don’t, for many reasons–the obvious one being that they could potentially hurt others or cost them their jobs. When keeping things to yourself seems too heavy a burden, there’s one app you can turn to: Whisper. It’s kind of like a social network where people share and check out each other’s secrets. Everything’s anonymous, so you don’t have to worry about getting found out or discovered. Just make sure you choose a username that people can’t link to you and hide your location from your posts as an extra measure to keep your identity a secret. You can choose to take a photo or choose a photo to accompany your post. You could also just type in your secret or thoughts and the app will find an appropriate image for your post. 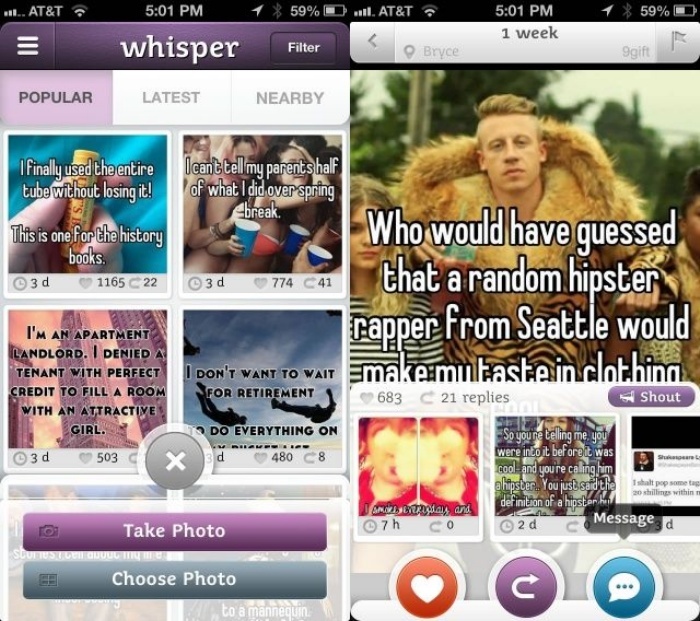 Whisper is available for free and can be downloaded from iTunes App Store and Google Play.